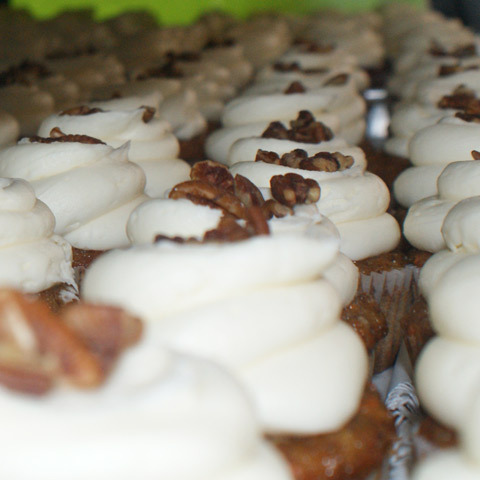 Billy’s Bakery has been a local staple of the Chelsea neighborhood since its opening in 2003. Store owners Marc Lino and Wayne Dovan have since opened locations in Tribecca, NoLIta and Midtown Center. All of their down-home deserts are baked right on premise, including cakes and cake slices, cookies, desert bars, pies and more. Popular indulgence range from classic vanilla and chocolate to original flavors like banana Nutella and blackberry key lime pie. The nostalgic 1940’s décor with a corner banquette provides a cozy seating area for patrons to enjoy their treats. Desserts are sold individually in the shop, but Billy’s also offers large-quantity combination packages for catering and delivery. For a fun twist on traditional customs, Billy's bakes elegant bridal cupcake tiers and custom "choose-your-own-pattern" birthday cakes. Café menu beverages are the smoothest in town, made with Jack’s Stir Brew Coffee, a company based out of New York City's West Village, who’s patented stir-brewing process is known to reduce bitterness and acidity. Billy’s Bakery prides itself on being a business dedicated not only to its original products, but also to its role in the community, where it donates frequently through local school and charity functions. Monday to Thurs 8:30 a.m. to11:00 p.m.
Friday + Saturday: 8:30 a.m. to 12:00 a.m.
We now offer delivery. Monday - Saturday, to any residential or commercial address in Manhattan. Please call.